1st Le Meridien Players Cup District Ranking Table Tennis Tournament is being held at Deccan Gymkhana, Pune from May 28 - June 3. The tournament has attracted a huge number of entries. The tournament is held under the aegis of PDTTA and it is the first tournament in this year's calendar. 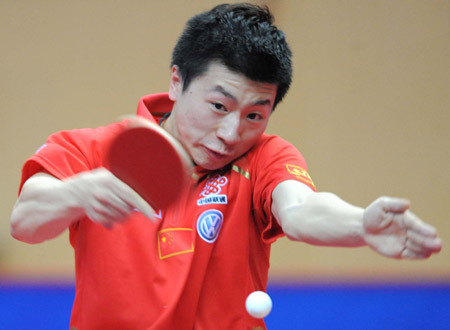 Paul Drinkhall, former runner-up of the World Junior Table Tennis Championships, has been selected to represent Britain in the London Olympic Games. He will be joined by Liam Pitchford and Andrew Baggaley. The Women's team comprises of Joanna Parker, Na Liu, and Kelly Sibley. Paul has recently been selected by Werder Bremen to play at this season's Bundlesliga (German league), where some of the best players in the World compete. 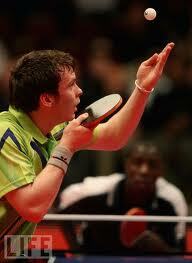 Chuang Chih Yuan, Adrian Crisan, Constatin Cioti will be his team mates at Bremen, where he will stay and train. He has just entered the top 100 in the World recently. New South Wales is an important state on the Australian Table Tennis map due to the presence of two important cities - Sydney and Canberra. 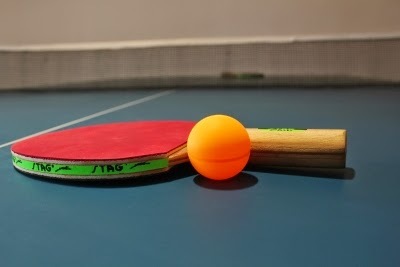 Ariel Hsing of USA will attempt to retain her title at the ITTF-North American Cup Table Tennis Tournament to be held at Mississauga, Canada. Her main rival will be Zhang Mo, whom she beat in the finals last year. In the Men's section, Pierre-Luc Hinse, Timothy Wang from the United States and André Ho will battle for the honours. Incidentally, all three qualified from the North America zone for the Olympics. Abhijit Das (WK) 98317 75140 National Coach, Played State, produced players, Coaching at YMCA & Bally Athletic Club. Avijit Roy Chowdhury (NK) 98313 02427 University Player, having Junior National & International Player Coaching at Dum Dum Kishor Mahal, Vivekananda Club- Hind Motor, East Kolkata Dist. Sports Council. Jyoti Prakash Mitra (HG) 98303 55081 Produced No. of State & National Ranked players, Coaching at Milan Samity, Serampore. China is now in a very strange situation. They had to name 3 players for the London Olympics and after a HUGE selection process spanning more than a year, they chose World Champion Zhang Jike, Wang Hao for singles and Ma Long in addition to these two for the team events. Now suddenly, Xu Xin, who is not even in the core team has burst into such terrific form, just losing the Korean Pro Tour by a hair's breadth (where he had a match point) and winning the China Open beating Zhang Jike and Ma Long comprehensively, thus leaving the Chinese TT management utterly confused. 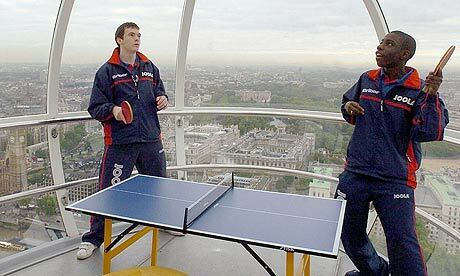 Remember, Table Tennis is high pressure there and their players are as famous in their country as our Cricket players. 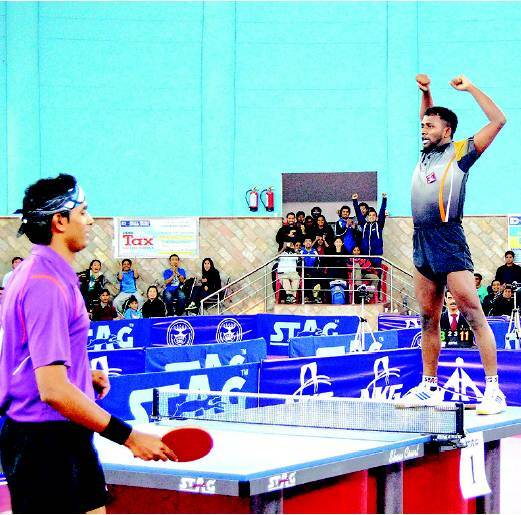 Ma Lin has fame that can rival Sachin. Any solutions? Huge discounts running on Donic JO Gold, Sonex JP Gold and Donic Platin. 1640, 1640, and 1790 on 3+ rubbers. 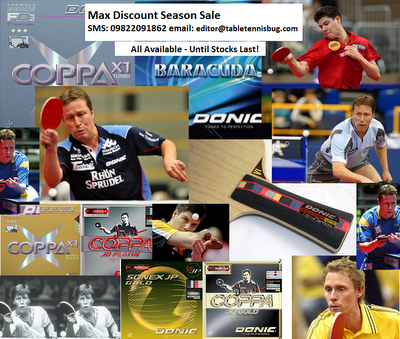 Have just 1 pc each all in black colour, but all at around 28% discount. Apart from this, coming on demand are the new gen rubbers and blades from Tibhar - Tibhar 1Q, Tibhar 5Q, Genius +Optimum, Aurus, Aurus Soft, Nimbus, Sinus series. Also available Tibhar Shoes, Apparel, Glue, Case, Accessories, Cleaners, Assembled bats and so on. Tournament – every Tuesday night. 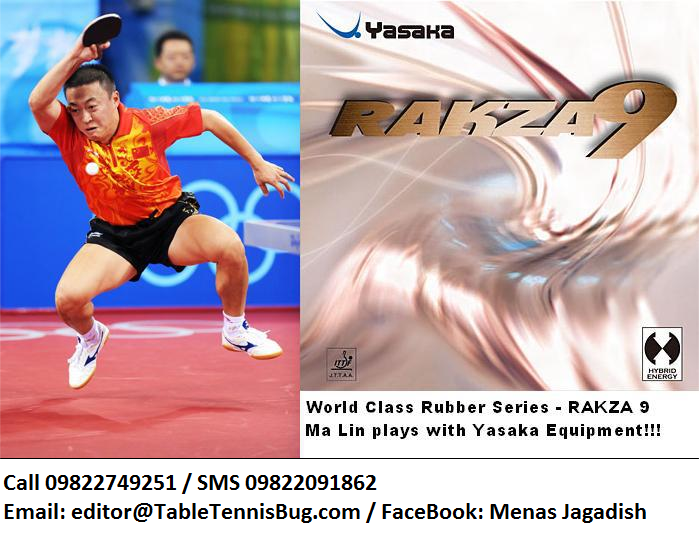 Ma Lin, Yasaka and Rakza series - a deadly combination! Ma Lin plays with Yasaka Equipment. Rakza 9 is a World Class rubber, created with after the best Research and Development. Rakza 9 is the fastest of Yasaka’s Hybrid Energy rubbers and is suitable for technical offensive players, using both high speed and spin to win the point. We have only 2 PCS. Others booked by pre-order. Also available Rakza 7. Great reviews. — at SMS to 09822091862. 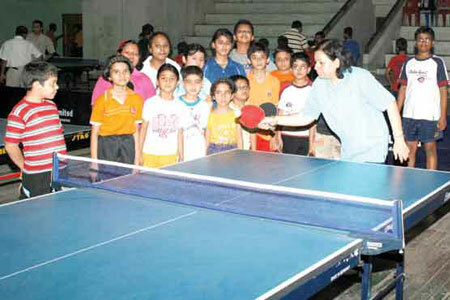 Photo: Nandini Baruah, the first International player from Assam teaching enthusiastic young players. 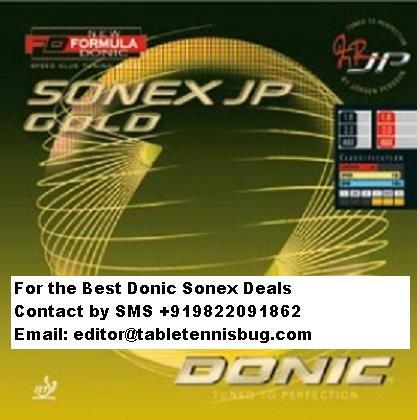 Donic Sonex JP Gold is one of the all time great rubber of choice for many players, both professional and club players. 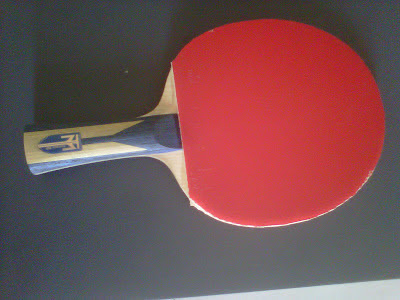 It has extra ordinary control and is especially good for counter hitting and blocking. When players first move from traditional rubbers such as Yasaka Mark V or Butterfly Sriver, Donic Sonex JP Gold is an amazingly good rubber to switch to as a top choice. Service returns are easy with this rubber due to the small amount of effort that is required to just direct the most spinniest of balls. On the other side, Sonex itself allows one to serve well. All in all, it is a great rubber mainly for the mid range to close to table playing style, but can be adapted to serve the experienced far table players too. 1st Karnataka Table Tennis State Ranking of season 2012 will be held at Cantonment Railway club. The tournament includes the ever popular NMS event. Ultratech is the main sponsor. Premium Provider of Table Tennis News, training information and Table Tennis goods at great rates! 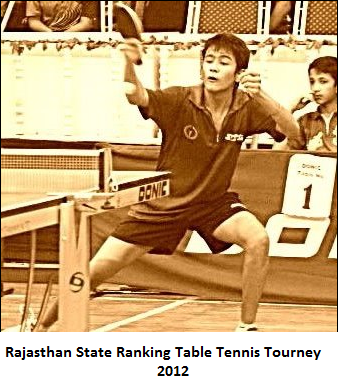 The 1st Rajasthan State Ranking Table Tennis tournament will be held at Chittor from June 6-8 2012. Play Table Tennis on Soo Yeon Lee's side and fight Cancer! Spin New York's poster girl for Table Tennis and international player, Soo Yeon Lee can be your team mate and so could Julie Benz! They are fighting for a cause and will be playing a celebrity Table Tennis tournament, in which you too can participate, provided you can raise the requisite funds ($ 10000 or about Rs. 5 lac). See this link for more details. Good luck!